Last month sees the advent of a second update to the model B, the model B+. The B+ comes with the notable change being the addition of two more USB ports and a slimmer form factor. All the connectors are aligned with board edges rather than the random overhanging shapes of the previous versions, see the picture below for a comparison between the two. 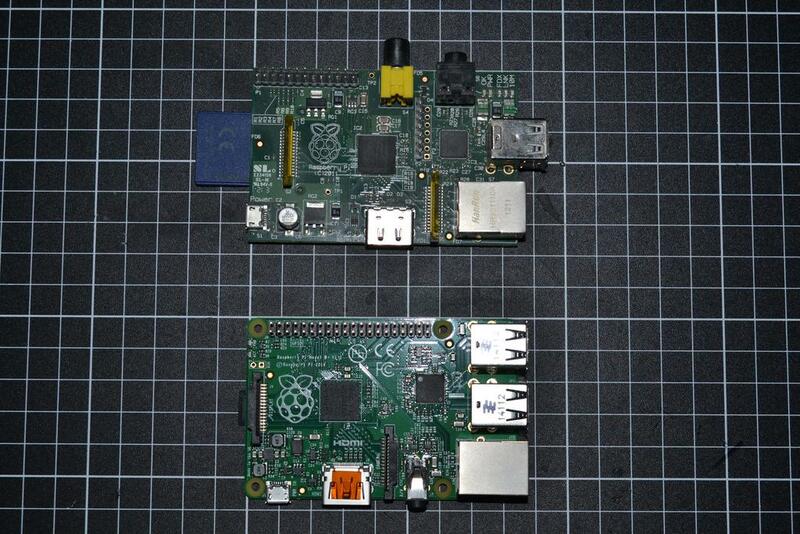 Raspberry Pi Model B with the model B+ towards the bottom of the picture. The grid is 10mmx10mm. In addition to this, the low drop-out regulators of the previous version have been replaced with switch mode equivalents. 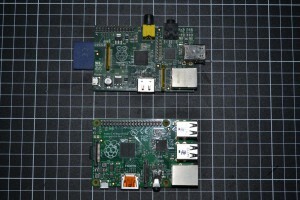 This, according to the foundation, has reduced the power consumption by up to 1W and should improve the Pi’s ability to handle lower quality power supplies. This is by far one of the more important changes, as anyone who has posted a query to a Raspberry Pi discussion board can tell you, the first suggestion was always “Get a better power supply”. Along with this, the GPIO header has been expanded to 40 pins from 28 in order to accommodate their new “shields” or HATs (Hardware Attached to the Top) as they’re being called. These are proposed to work similar to the Capes on the Beaglebone, or Shields on the Arduino, in that they should be able to plug directly into the Pi and need minimal configuration. This is aided by the inclusion of two dedicated pins on the 40-pin GPIO connector which will be used for connecting an EPROM, containing the configuration required for that HAT. Further information regarding HATs and how to design them has been published to Foundation’s GitHub repository. Another change most will notice, is the move from the use of SD cards, to micro-SD cards. With the almost ubiquitous uptake of android smart phones, high capacity, high speed micro-SD cards can now be had for as little as $30, making them a cheaper alternative than full sized SD cards. More importantly in my opinion, is the move to a decent locking connector for the card, rather than the friction fit one used on all previous models. This prevents the card from being bumped, knocked, or just plain falling out. This also adds to the more professional finish to the B+, as it no longer protrudes from the board edge. Finally the last change to mention is the move to put the audio and composite video on a single 4 pole headphone jack, and give the audio amplifier it’s own power supply. The choice of connector is a reasonable one with 4 pole jacks becoming more readily available, thanks again to phones. The addition of a separate power supply for the audio amplifier, should help with noise on the output, which could be a bonus to some who may be feeding the audio output into transmitters for digital modes or repeaters, although personally I’ll probably never notice. I’ve had the B+ for a little over a week now and it seems to be just as easy to use as it’s predecessors. I immediately copied the image directly from the original model B I had to hand and connected a 2.2” SPI TFT, noting that pin one is on the left hand edge . Much to my surprise it started first time with the X server displaying on the TFT as expected. Unfortunately none of the USB peripherals worked. It didn’t matter what was connected, WiFi, keyboard, mouse, serial adapter. None of them seemed to work, or power up for that matter. It appeared as though maybe there was some new way in which these were interfaced to the ARM processor, that the firmware I had wasn’t doing. A quick download and flash of a current SD-card image resolved the issue and everything worked like a charm. One thing that is often praised/mentioned about the new B+ is the increased current handling of the USB ports of the B+, with one video showing an external hard drive being run off it. I tried connecting the drive directly, and was unable to get the drive to function correctly, with it repeatedly spinning up, starting to read and failing, synonymous with too little current available. I have since learned that there is a new boot option which increases the maximum current that USB devices can draw to 1.2A from 600mA. I was able to reproduce a bug in the firmware which has been noted by others: if the B+ is shut down from the command line using “sudo halt”, it can be woken up by touching, or getting near to pins 29 and 30 on the GPIO connector. This has since been patched, although this has yet to make it into the images on the website at the time of writing. Overall I would recommend the B+ over the old model B given there’s almost no difference in price and those extra USB ports are always welcome. The reduced power consumption and resilience to cheap power adapters is another welcome improvement. Although how much interference the switch-mode supplies produce is something beyond my ability to meaningfully quantify. However given my praise for it, I wouldn’t rush out and ditch my model B for a B+. This is due to it still having the same hardware with the same performance, so unless you need more GPIO/USB, I wouldn’t rush out to upgrade.